University Librarian and Dean of Libraries John Wilkin will receive the Hugh C. Atkinson Memorial Award, which recognizes achievements in library automation or management. 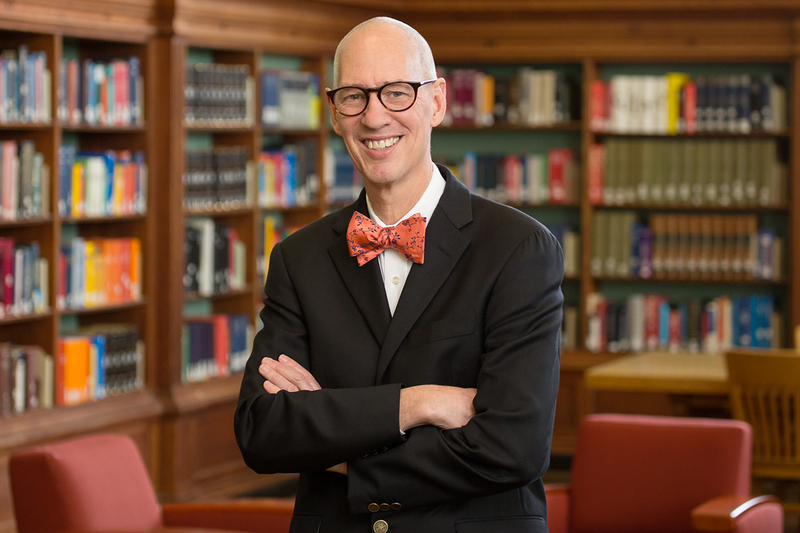 CHAMPAIGN, Ill. — University Librarian and Juanita J. and Robert E. Simpson Dean of Libraries John Wilkin is the 2019 winner of the Hugh C. Atkinson Memorial Award. The award, named for a former University of Illinois librarian, is given by the American Library Association to recognize an academic librarian who has made significant achievements in library automation or management and notable improvements in library services or research. “John Price Wilkin exemplifies the spirit of the Hugh C. Atkinson Memorial Award through leadership, risk-taking and innovation,” said Bruce Johnson, the award committee chair and former senior library information systems specialist at the Library of Congress, in the announcement of the award. Hugh C. Atkinson was the university librarian and dean of libraries from 1976-86. When he arrived, the library had a filing backlog of nearly a million catalog cards. Atkinson spearheaded the move to automation, and by 1978, the facility was the first major research library in the U.S. to have an online catalog. Atkinson also worked to create a statewide computer-linked library network. It included more than 2,400 libraries, including public, elementary school, university and corporate libraries. Wilkin was an early adopter of structured markup languages such as SGML and XML, providing access to digital texts as well as a means for searchability and textual analysis, and inspiring online publishing efforts such as the California Digital Library, Johnson said. Wilkin led a groundbreaking effort to digitize 19th-century books and he helped launch JSTOR, a digital library of academic journals, books and primary sources, he said. Wilkin joined the U. of I. in his current role in August 2013. He served as the interim provost from February 2017 to January 2018. Before coming to Illinois, Wilkin served in a number of library-related capacities at the University of Michigan over the course of two decades, most recently as the executive director of HathiTrust and the associate university librarian for publishing and technology. He also worked for two years at the University of Virginia, Charlottesville as systems librarian for information services. Wilkin earned graduate degrees in English from the University of Virginia and in library science from the University of Tennessee, as well as a bachelor’s degree in literature from Antioch College. Former University of Illinois Librarian Paula Kaufman received the Atkinson award in 2010.